All kids benefit from active, engaging summer programs. Summer “slide” or learning loss affects all children, but it has a dramatic effect on low-income students and widens the opportunity gap for kids whose families cannot afford typical summer programs like camps, lessons or sports. They fall even further behind and experience academic decline, increased weight gain, boredom, mischief, and sometimes even criminal behavior. 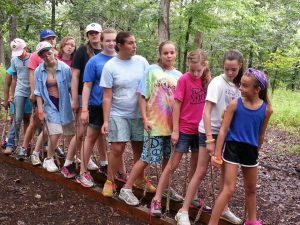 Our evaluation data shows more than 75% of our campers experience growth in all eight areas! Our campers enjoy daily reading time, unique STEM activities, swimming, hiking, canoeing, fishing, archery, low and high ropes courses, three healthy meals a day, increased physical activity, and stress-relieving time outdoors. You can be a part of making summer different for children in need. Help us transform lives by connecting with Wildwood. Become a volunteer. Join us for a week or an hour. You will learn and grow as much as our campers! Email us for more information. Share our message. Follow us on social media using the links below, read and share our newsletter and tell your friends. The Greater Kansas City Community Foundation reviews and provides in-depth information about area nonprofits, including financial, governance and programmatic details.